Blacklisted by Hollywood during the 1950s, American director Jules Dassin went to France and made Rififi (1955), considered by critics to be one of the greatest heist films ever made. It also became part of a thriving French film noir movement that included key films like Touchez pas au grisbi (1954) and Bob le flambeur (1956). He won the Best Director prize at the 1955 Cannes Film Festival and this helped reinvent himself as a European auteur, as J. Hoberman points out in his liner notes for this new Criterion Collection edition. Career criminal Tony le Stephanois (Servais) has returned to Montmarte after a five-year stint in prison. He took the fall to protect Jo le Suedois (Mohner), his youthful protégé. In need of money after Jo rescues him from an all-night poker game, Tony teams up with his apprentice, an Italian pimp (Manuel) and a safe cracker from Milan (played by Dassin himself) to knock over Mappin & Webb, Paris’ answer to Tiffany’s. Tony is no spring chicken and needs to be convinced that he can still run with a younger group and do one more job – a very difficult gig, but with a big pay-off. Tony may be long in the tooth, but he’s still a tough customer as an ex-girlfriend finds out when he gets her alone, tells her to undress – starting with her expensive jewelry – and then beats her. Afterwards, Tony tells her to get dressed before throwing her out and keeping the jewelry. 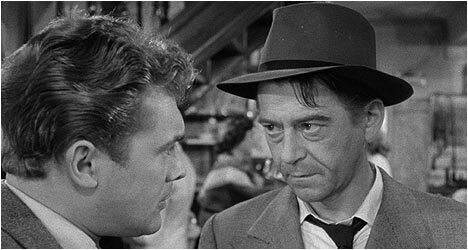 The cast is uniformly excellent with Jean Servais and Carl Mohner, in particular, as real stand-outs, playing well off each other as mentor and protégé respectively. Servais’ Tony epitomizes world-weary toughness, while Jo is an impossibly good-looking criminal at the top of his game. The famous 30-minute burglary is not only a masterfully tense sequence that is impeccably choreographed by Dassin, but also pays close attention to how Tony and his crew go about plying their trade in the kind of attention to detail that would Michael Mann green with envy. Rififi garnered nearly universal acclaim and performed well at the box office, going on to cement its reputation as one of the best heist films every committed to celluloid. Fans of this film will be happy to know that the new Criterion Collection Blu-Ray shows more information on all sides of the frame than any other previous digital edition. The black and white cinematography looks fantastic and appropriately moody for a film noir. There is an interview with director Jules Dassin where he covers a variety of topics, including the making of Rififi. He talks about getting involved with the film and recounts many anecdotes about adapting the book it was based on, casting himself in a pivotal role and, of course, the famous heist sequence among other things. Also included is a stills gallery with promotional photographs, beautiful set design sketches and behind-the-scenes pictures.